In my last post I wrote about the Viliv S10, a super-efficient Windows-based PC that would serve well for solar-powered work duties. Last week at Mobile World Congress in Barcelona I tested out another interesting bit of kit. This one looks much the same but in terms of internals, it’s like chalk and cheese compared to the S10. 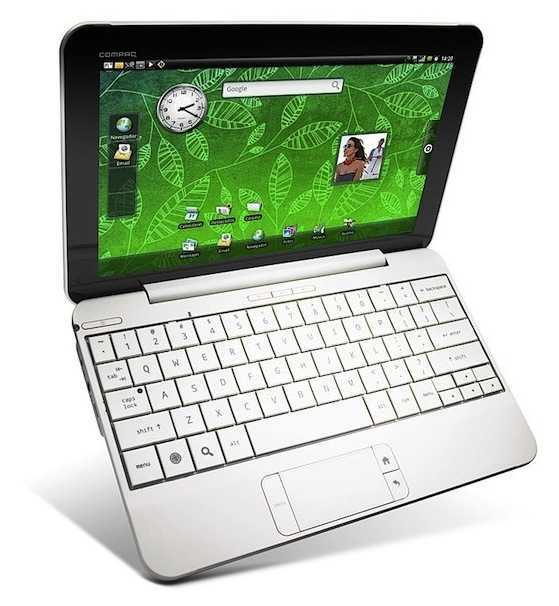 The Compaq AirLife 100 is basically a smartphone cased in a netbook housing with a 10″ touchscreen and an estimated 30wh battery. The operating system is Android which has a great browser (although not as good or fast as Firefox or Chrome would be on the S10) and the ability to run many Android applications. The build quality is good, the keyboard is good and with 3G and Wifi built-in, connectivity is also good but the fantastic thing about this one is that it can idle with the screen off for DAYS instead of hours. In theory (untested) this little baby could run, connected to GPRS data providing 30-second GPS (built-in) location updates and polling email or similar services for about 3 days on a single charge. To top it off, it’s even more efficient than the S10 when running at full steam AND it weighs about 25% LESS! With a 16GB SSD topping off the specs you’ve got a great lightweight, semi-rugged possibility. Est. 150 hours occasional automatic GPS location uploads via cellular data. Add a 60wh power pack and if you’re careful with back-light and connectivity, you’ll get a weeks work out of it….in about 1.3KG! This isn’t going to be the fastest productivty device you’ve ever used but if efficiency is more important than processing speed, the Airlife 100 will take some beating. The Airlife 100 is due in the Spring and i’m quite excited to test it out longer term. nice review, this just may beat out the viliv s10, but can i skype on android?